The new Eyeko range features 5 new shades from sheer pink through to this rather gothic black with red glitter called Vampira. As with all Eyeko polishes I’ve tried, the first coat applies streaky… my trick to achieving a good finish with these polishes is a thin first coat, followed by subsequent thicker coats. Don’t worry how crap that first coat looks… just get some product onto the nails and map out the shape you want. If you start thick then it’s gonna take longer to dry and will be more likely to drag at the cuticles when you lay down that 2nd or 3rd coat. You can see that I got decent coverage with 2 coats following my method above. Unfortunately I then needed to add a couple of coats of top coat to smooth out the rough, gritty surface thanks to the glitter. This fnish might not bother everyone, but it kinda sets my teeth on edge. Wear has been fine with no chipping (though I never seem to have a problem with chipping and I know other people do), average tip wear and when I did finally remove it (after 3 days) it didn’t give me a TOTAL nightmare considering how packed full of glitter it is. 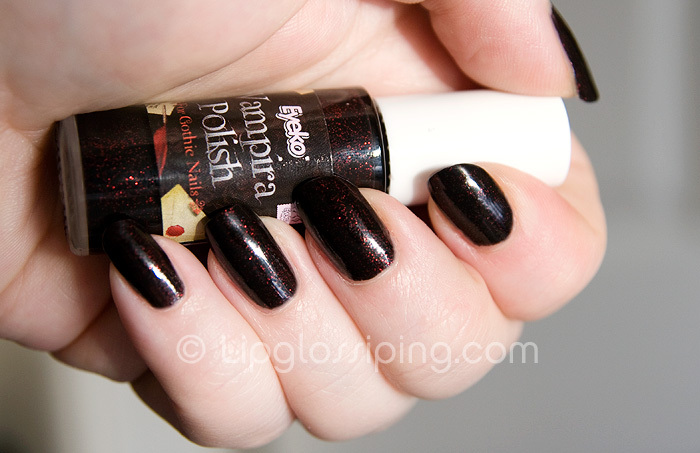 Overall it’s not my favourite Eyeko polish I’ve tried… the black/red glitter mix is kinda chunky. Still pretty good value for £3.50 though. I keep looking at this on the website and wondering whether to get it or not! I love the flashes of red glitter, think this might be more an autumn/winter colour for me! Oh its so so so pretty! I think this amazing! I love how it’s a black base but it doesn’t hide the glitter at all. I loveee the way it looks! ooh, this is lovely! i’m not really a fan of black nail polish coz it’s too hipster for me. but this is a great take on dark nails. I think I need this. I’m such a goth at heart! Oh I’m glad you tried this out as I’ve just got these for my website and was planning on trying them all out this weekend! Wow, for £3.50 that’s a lovely polish!! ooohhh i love this! i think it might be better than lubu heels by china glaze! love your nails! Win It! Miss Sporty Metal Flip Duochrome Nail Polishes!